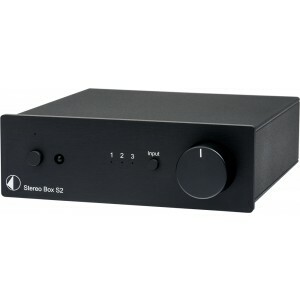 This is a great value alternative to the Stereo Box S2BT if you are not looking for Bluetooth connectivity. Earn 215 loyalty points when you order this item. Pro-Ject Stereo Box S2 features three line level inputs and offers the versatility to connect to many sources. The world’s smallest audiophile integrated amplifier, Stereo Box S2 packs enough power to drive even demanding speakers to their peak. The 3.5mm variable output on the rear panel can be connected to a power amplifier, subwoofer or active speakers. With its tiny form factor, Stereo Box S2 fits into every environment and the stylish silver or black full aluminium/metal casing is sure to be a great match for any interior. The solid casing not only looks elegant but also protects against vibrations and unwanted interferences. For superior convenience, Stereo Box S2 is fully remote controllable, you can switch inputs and control the volume with the ease of pushing a single button!